With my shop being closed for the past 3 and half months, I've had some time to really think about the direction and focus I want to take with it. As with many things in life, One Hundred Wishes is evolving a bit, and I'm excited about the changes! I thought I should fill you in before the shop opens on Monday. I have decided to eliminate some existing categories and add a couple of new ones. You will now find all of my handmade art and crafty goods under one heading: Original Art Creations. This will be an ever-changing assortment of unique items I have crafted with my 2 hands (which need a manicure at the moment). When they're gone, they're gone. I'll move on to something fresh and new, whatever I happen to be inspired to make at the moment. The handmade goods you have seen in the past (paper cakes, trinket cones, bon bon cups, journals) are no longer available. I've got some fancy decorated eggs in the works right now. They are sitting here in the studio, freshly painted and waiting for pretty embellishments. They are part of The Big Easter Event which will debut on February 12 with these handmade items among other wonderful Springtime goodies. 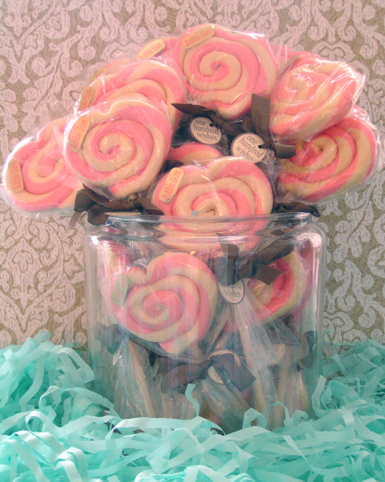 Another new & very exciting category is Decorative Treats. In this section, you will find seasonal and everyday decorative art from well-known and very talented artists. The selection of Decorative Treats will continue to grow and change with the seasons. The first batch of goodies will be available February 12, as I'm still waiting on a big shipment that should be here right around that time. A not-so-subtle hint: think Nicol.....and then Wendy in April. 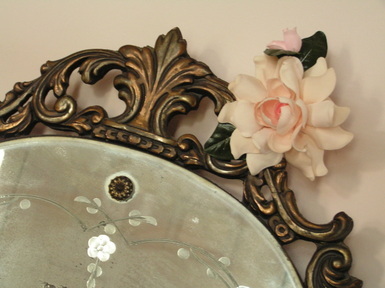 I'm also putting big focus on seeking out and offering you more fabulous ribbons, new trims & twine, old papers, new Dresdens, vintage millinery flowers, more baubles, fun cupcake trinkets, new colors of German glass glitter and much more! I hope you like what I have in store. I am so passionate about this shop and every detail that's involved. It is truly a labor of love. Very consuming and very rewarding at the same time. To all of my past and future customers, I thank you for sharing my passion and allowing me to turn one of my biggest wishes into a reality. On a different note, be sure to stop back tomorrow for a celebration you won't want to miss! What is it about treats on a stick? They're just fun to eat, don't you think? Maybe a little messy but well worth it. I got the recipe for these delicious Cheesecake Pops from the book Sticky, Chewy, Messy, Gooey by Jill O'Connor. 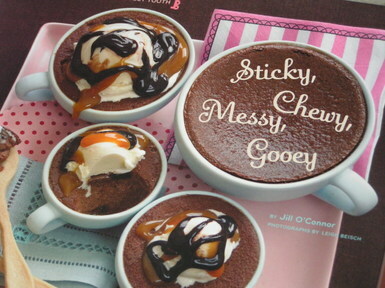 If you enjoy baking, I'd say this book is a must-have. It's full of mouth-watering color photographs that will inspire you to get the measuring cups out and tie on your apron! 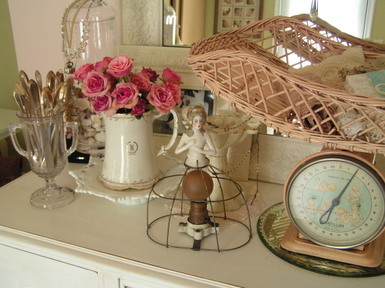 There are baskets full of ballerinas in my studio waiting for opening day. The one pictured here is 5 inches tall. 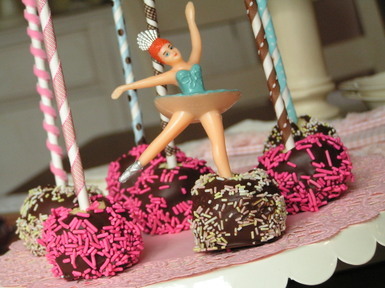 Among other things, I've added a ton of cupcake trinkets like these to the shop. There are hearts, cameos, scripty words and much more. You can see them all on Monday. 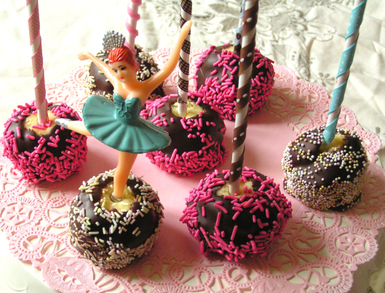 Now, I think I'd better stop baking and start working 'cause Monday is right around the corner! ...that Sally Jean has a BLOG??? Seriously, how did I not know this already? I am a dearly devoted fan of her art, charms, style, book, etcetera, and I had no clue. Looks like I'll be spending some serious time glued to the computer catching up this week. Can't wait! 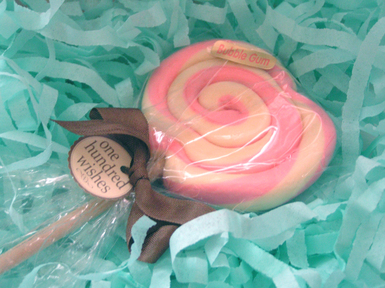 .....and that can only mean one thing: One Hundred Wishes is reopening soon! On Monday, February 4th to be exact. I closed the shop back in October when I was ready to have my baby, Sam. My belly was so big I couldn't even sit at the desk and fill orders anymore. I can hardly believe that was over three months ago already. 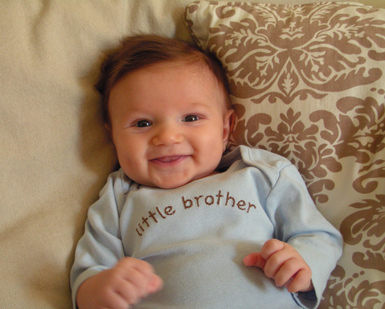 My, how time flies when you're changing diapers all day! So, anyway, good things are in store. I've been placing orders and filling the shelves in my little studio with new items that I think (I hope) you will love. I'll share some little glimpses this coming week. Yes, I know, I know, I know. I've been a bad blogger! 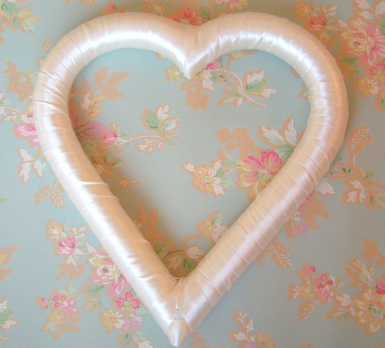 I've just been busy getting ready to reopen the shop (more details soon) and doing a bit of long-overdue crafting. I'll try to be a better blog girl from now on.....but I can't make any promises. Oh, and thanks for pouring on the love for Sam. I'm glad I'm not the only one with the urge to eat cute chubby babies! So, anyway.......I've been loving tulle forever. 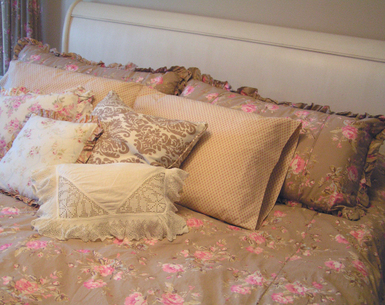 It's undeniably vintage girly yet somehow there's a modern flair to it. It's just fun! 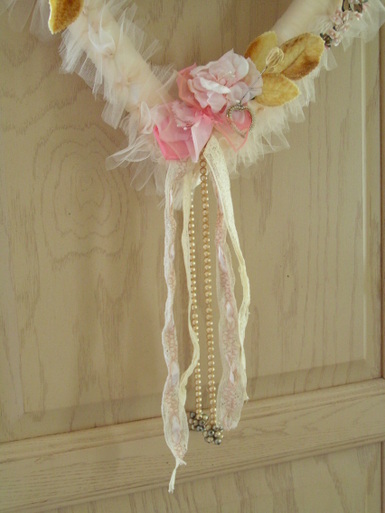 A year or so ago, I made this hanger (above) after seeing one in Rachel Ashwell's book, The Gift of Giving. (page 71 for those of you who are going to go check it out.) 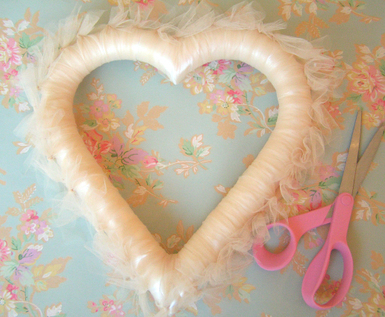 I simply cut lengths of tulle from a 6" wide spool and tied each piece in a double knot on a wire hanger. This part seemed to take forever. 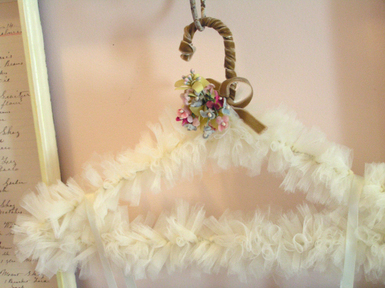 Once the entire hanger was covered, I trimmed the tulle so all of the pieces were somewhat uniform in length. 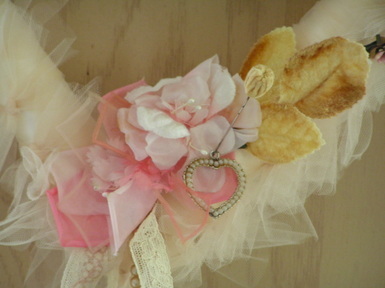 Then I added a velvet bow and some flowers to the top. It doesn't get much simpler than this. I wouldn't make a closet full of these, but one standing alone looks special. I have an old light blue lacey slip hanging on it on the back of our closet door at the moment. 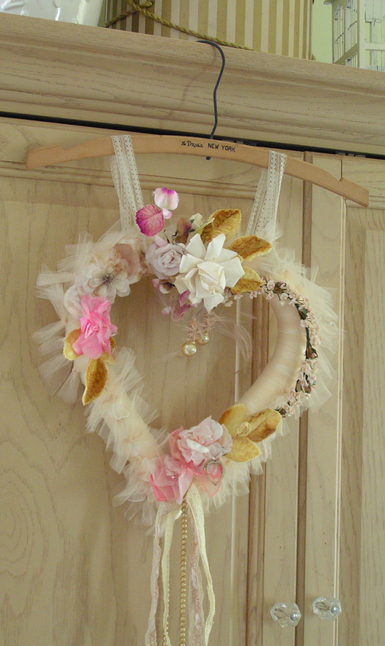 Still on the tulle kick, I thought to make a heart-shaped wreath for Valentine's Day. If any holiday can handle tulle, it's most definitely this one! 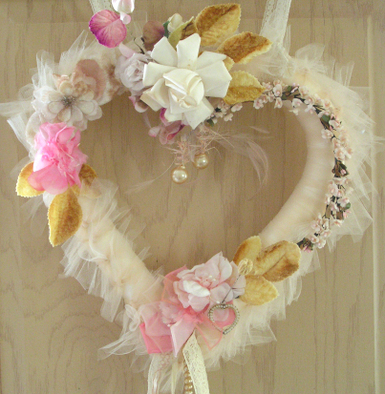 Same idea here except I started with a Styrofoam heart wreath form that I wrapped in 1" wide ivory satin ribbon. Then I began tying on the tulle strips and trimming the edges. After that, it's just about embellishing in whatever fashion you choose. This is the fun part! 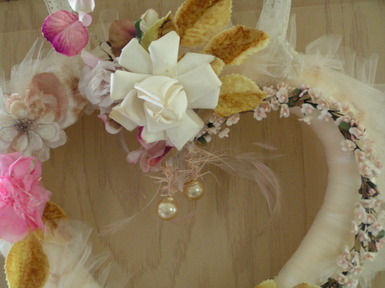 I used mostly old millinery flowers and hung some lace streamers and a pearl necklace from the bottom. 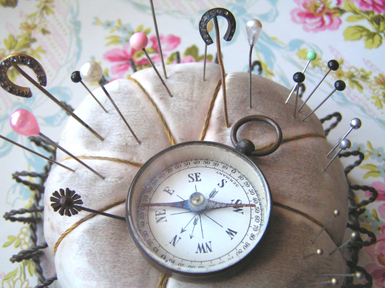 There's a sweet little pearl heart charm held on with an old velvet hat pin. I must say, I'm in love with this golden yellow color lately. I have never ever considered myself a yellow person, but this shade is pretty and now it's even popping up in the house decor here and there. ....showing you some pictures I took today. 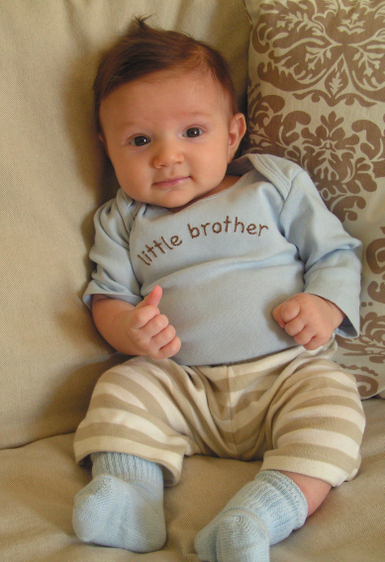 Oh, I could just eat him up. A few months ago, I discovered a great little blog written by Abby Kerr, the owner of a French-inspired boutique called The Blissful. As I browsed around the blog and read the information in the sidebar, I could not believe my eyes. This gem of a shop is located just a few miles from where I grew up in Ohio! So naturally, when I was home for the holidays, visiting the shop was high on my list of things to do (as well as eating plenty of my sister-in-law's homemade peanut butter fudge and my grandma's homemade linguine). I enlisted my mom as a partner in crime and headed there the day before Christmas Eve. We were not disappointed. I wished I could buy every single thing in the store. Better yet, I could just move right in and live there.....after all, Abby had a gorgeous bedroom all set up in the shop to showcase the custom bed linens she offers. Alas, I had to restrain myself. Lucky me, I can visit again next time I'm in town. No detail was overlooked. Abby has transformed the space into an amazing visual feast of a boutique. You can see the incredible before and after photos of the retail space here on her blog. 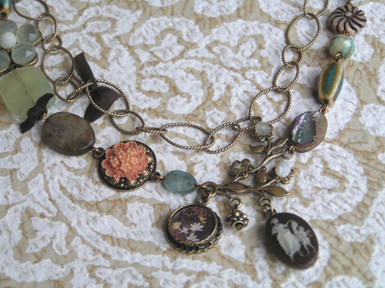 I splurged and purchased this necklace by Elements (Jill Schwartz). 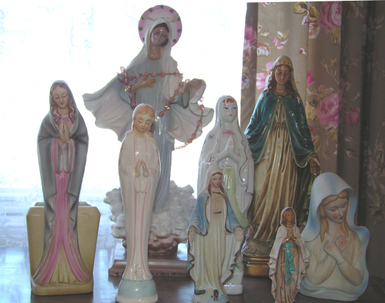 I've admired these pieces for quite a while now and had only ever seen them on-line, never in person. It's just spectacular in person. 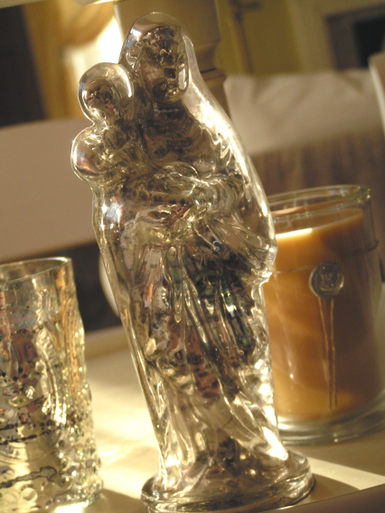 I also picked up a couple of mercury glass votives for the mantle, a Votivo candle (the Red Currant scent has a cult following) and this mercury glass Mary to add to my collection. And this is my favorite purchase of the day. Do you love? Or is it just me who squeals at the sight of pink chipped metal? 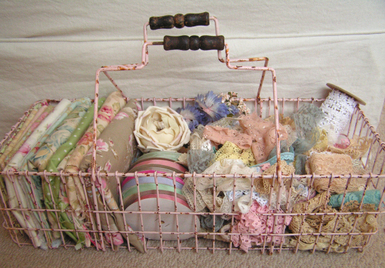 This large market basket could hold all sorts of different items, and I'm sure I'll change it up every now and then. For now, it will store fabric and laces and scrumptious old trims. I bought a few other things as well, but they are part of a birthday present for a friend. I can't show you here because it will spoil the surprise! Are you ready for the best part? 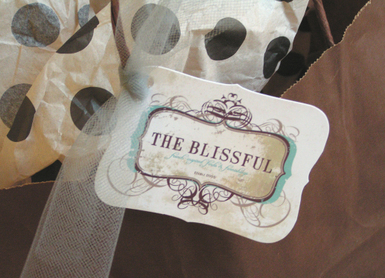 The Blissful is opening it's doors on the Web this February! 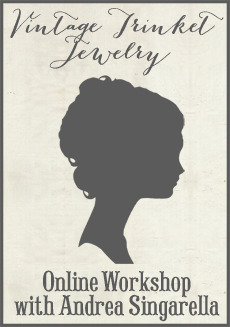 So now you can shop this amazing boutique right from your comfy cozy chair at home. Lucky you! A big hug and sincere thanks to each of you who commented on my previous post or sent me an email. It means a lot to me to know I am not alone and that so many other mothers have felt the way I was feeling. Yesterday was a much better day and today is going great. I'm just trying to slow down and take each day as it comes. I appreciate your advice, the words of wisdom, the compassion. It continues to amaze me that I can feel such a connection to so many people I have never met. The stars are aligned and both boys are napping right now. I'm going to go rest for a bit myself. This is something I absolutely never do, but I am today. It's just a napping kind of day. I'll be back on Monday, refreshed I hope! But for now......nighty-night girls. I've had a rough couple of days. Nothing major and certainly nothing that most mothers don't go through at some point. Just a major lack of sleep and not knowing if Sam is getting enough to eat and wondering why he seems to cry 24/7. I have so much to do and the days seem to slip by. Am I doing something wrong? I'm not sure. I could cry at any given moment and feel like soaking in a bubble bath for a week straight. No phones, no computer, no cooking, no obligations. Just quiet stillness. So, to cheer myself up a bit, I walked around the house and started snapping pictures of my favorite little bits. My everyday beauty. I don't do this often enough. I love our home and all of the little things inside of it. These small things make me smile. As I sifted through the pictures I took, I found that most of them had flowers in them. My eye is just drawn in that direction I guess. I'm certainly ready for Spring flowers. This non-daylight savings crap is for the birds! I need sunshine and light and longer days. This is an old mirror on the wall in the foyer. My mom and I never visit each other empty handed. She brought this for me when she came out in October for Sam's birth. It's one of my very favorites. The picture above was random luck. I was rearranging things on some nearby shelves and had set everything on the buffet while I dusted the shelves off. I glanced over at the buffet and thought to myself, "this looks like a table at a flea market." I loved this vignette I had created purely by accident. I almost didn't want to put everything away! This is my mom as a child. 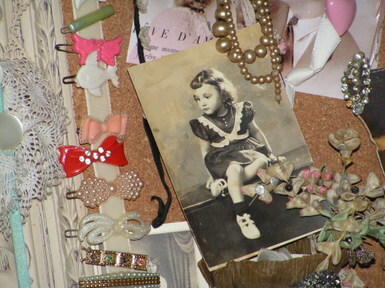 And some old barrettes I've gathered along the way. 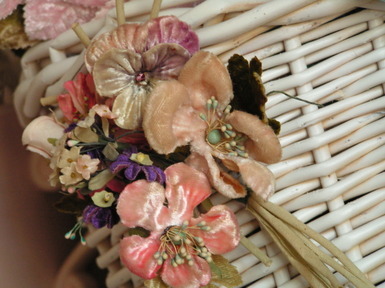 Just a beautiful old corsage. The faded colors are to die for. 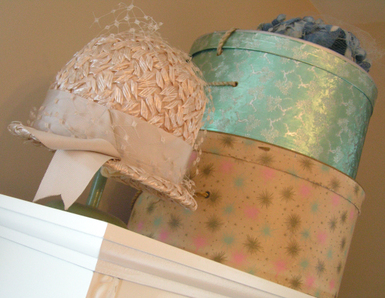 This old aqua hatbox was found hiding at the top of my grandma's closet when I visited her last summer. She always asks me to come over and go through her things and take whatever I'd like. There are some really cool old things hiding in that house. 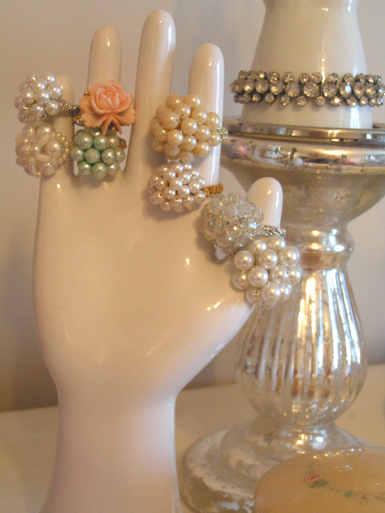 She also gave me most of these old beaded cocktail rings (below). They sit on this porcelain hand on my dresser. So, there you have the nickel tour of some of my favorite things. There are lots more, maybe for another rainy day. Thanks for "listening" to my ramblings. Tomorrow is a new day and hopefully a better one. So, does anyone want to come over and cook dinner? 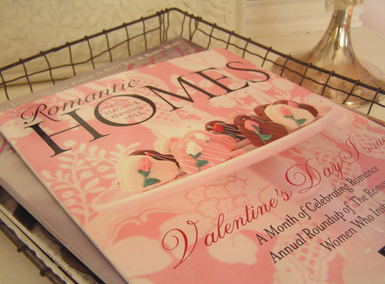 Have you seen the February issue of Romantic Homes magazine? As usual, it's chock full of beauty and inspiration. This month, there is a section titled The Romantics, featuring several women entrepreneurs who lead romantic lives. I always enjoy reading about other women who have turned their dreams into a reality by doing what they love, and doing it in a beautiful way. As serendipity would have it, back in October, Tanya Whelan contacted me for some help in creating a collage vignette for this article. I love styling vignettes and, of course, I gladly accepted and was excited to work with her on the project. Tanya is a fabric designer for Free Spirit and also has her own company called Grand Revival. You can read more about Tanya and her love of sewing, designing and her vintage-inspired lifestyle here on her beautiful blog. 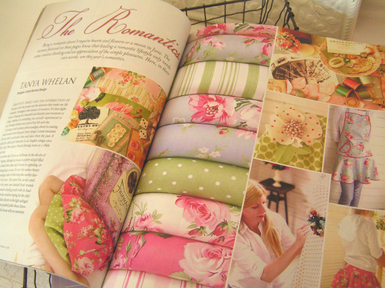 I gathered several items and created the vignettes in the top right corner of each page, using vintage sewing supplies, buttons, swatches of her Barefoot Roses fabric, Tanya's business card and other mementos with special meaning to her. It was a fun project to work on and a nice break from the usual kinds of things I create. You can click here to see some inspiring and fresh creations using her Barefoot Roses fabric collection. I seriously want to sew each and every item on the page. I have the pattern for the Flea Market Bag and plan to make it one fine day before I hit the flea markets this spring with my mom. 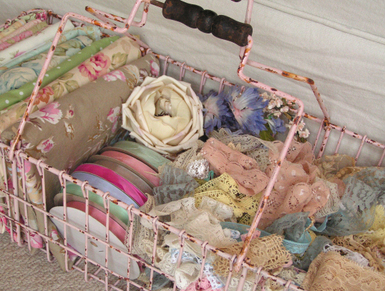 I'm really itching to go find some discarded vintage treasures!